The IRG 4000 time domain reflectometer is integrated in BAUR cable fault location systems and is used in combination with the system software for locating cable faults in single and three-phase cable systems. Thanks to the novel operational concept, cable faults can be located more rapidly and easily with IRG 4000. The high-performance industrial PC and improved measurement parameters allow for a precise cable fault location in all cable types. The well-proven and continuously enhanced methods are available for the cable fault location as well as the newly developed Conditioning SIM/MIM** method which makes it even more effective and quick to locate wet cable faults that are difficult to detect. 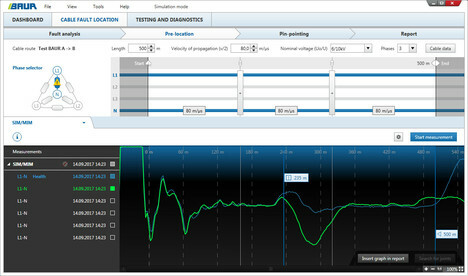 The SIM/MIM technology with 20 reflection measurements per HV pulse allows for selecting the best reflection image for a very precise determination of the fault distance.